I gave far too much thought about which jumper I should wear to Sheffield. On the one hand I had worn the same one four years running and we had always come away with some awards. On the other hand people might think it was the only one I owned. Boldly, I chose a different jumper, albeit essentially the same colour. Once again we had been nominated in two categories for the annual Film Society of the Year awards in Sheffield, rewarding the hard work which Manon and David Saitch put into running the Hurst Village Cinema. I travelled up early on Friday and on arrival watched two films which are well worth a viewing; American Animals and The Miseducation of Cameron Post. I met up with David later, who was looking nervously over his shoulder for Newcastle Film Society who seem to have anointed him as their designated drinking buddy. As a group they were later to be awarded the Roebuck Cup, leaving David to muse that his shoes were too big to be filled by just one person. 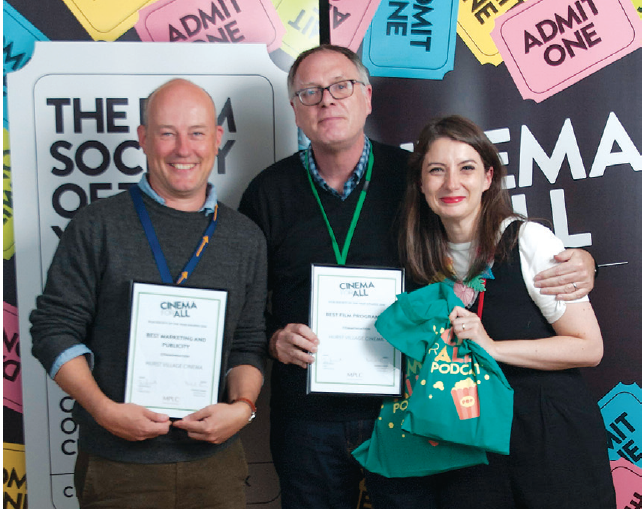 David, with less than eight hours of his reign as Roebuck Cup winner left, had been asked to be on the Community Cinema Review of the Year panel entitled ‘Challenges and Success’. Unfortunately, going after Liz from Leigh Film Society meant much had already been said. What did emerge, however, was that Hurst Village Cinema is almost unique in having only three people at the helm. Other organisations have up to 30 volunteers and their scope and brief is much wider than ours. “It makes everything you do more amazing,” commented the Deborah Parker, the Chief Exective of Cinema for All.